An open circuit induced draft cooling tower is a tower equipped with a large mechanical fan which forces air through the tower to cool the circulating water. This water is typically maintained at 85°f for use with general process machines. The phrase “Open Circuit “means that the water going through the tower is ultimately going back to an open tank. Quite simply, water cooled by the fans is directed out toward the manufacturing process needing cooling, later returning to the cooling tower as HOT water. 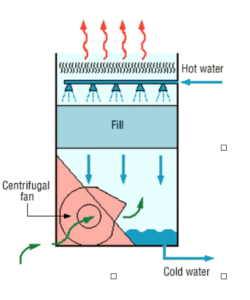 Excess heat escapes the tower; the water is further cooled via evaporation and the action of the fans, then directed back to the process needing cooling, completing the circuit. This type of system does not get air-bound due to it being an open circuit. This type of cooling tower is typically used by manufacturers for cooling oil or air compressors, process furnaces, or any machine generating excess heat. An open circuit natural draft cooling tower is a very simple tower circuit that cools without the use of fans. 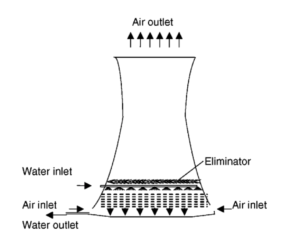 This system relies on natural draft or the “chimney effect”, meaning that the movement of air into and out of the cooling tower results from air buoyancy. Buoyancy occurs due to a difference in indoor-to-outdoor air density resulting from temperature and moisture differences. Hot air produced by the manufacturing process will naturally gravitate up through the tower, leaving cool water behind. These natural draft towers are much bigger in size than the induced draft towers and have the ability to cool large volumes of water. This type of cooling tower is used by electrical energy producers and is commonly found at power plants. Construction of this type of tower is a huge investment, but reduced maintenance costs and low thermal energy waste make it an appealing option. 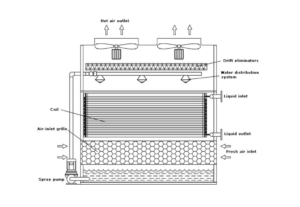 A closed circuit induced draft cooling tower operates, for all practical purposes, in the same way as an open circuit cooling tower – but with a heat exchanger built into it. Because this is a closed circuit, however, the process cooling fluid, which is typically just plain water, is completely isolated from the atmosphere. The water being cooled is pumped through the circuit and diverted to the heat exchanger as needed. The function of the heat exchanger is the transfer of the heat from the water inside the coils to the surrounding air. Baffles on top of the tower open to release this heat; exhaust fans may also help reject heat. At this point, if additional cooling is needed, the spray pump will shower water over the heat exchanger coils. Once the desired set point is reached, the cooling fluid is returned to the process circuit. This type of tower is also referred to as a “Closed Circuit Cooler”. These are generally used for cooling multiple water cooled HVAC systems and /or multiple heat pumps in a manufacturing setting. Additionally, this type of tower may operate in conjunction with a chiller. A notable advantage to this type of system is protection from external contaminants. This information is intended only to provide an overview of the basic operating principles of various cooling tower systems. There are many options available; cooling tower types are classified by build, heat transfer method, air draft, and air flow patterns. Both open and closed circuit towers are effective means of cooling water. Operating costs, energy consumption, and maintenance requirements are considerations that should be regarded with assistance of professional system designers and installers. Contact sales@monadnockcooling.com to speak with a representative who can help resolve your industrial cooling issues.